Suggestion Sheets for VB-MAPP Kit Now Available! The VB-MAPP Assessment Kit now comes with suggestions for use! Based on your feedback, we’ve carefully put together a supplemental packet that correlates each product in the VB-MAPP Assessment Kit with the task in the Milestones Assessment in the Protocol. Additionally, we’ve gone ahead and added an interpretation of each task along with suggested materials, activities, and reinforcers for each level in the Milestones Assessment. Finally, the packet contains language and word lists along with Data Sheets to keep you organized. Lists include Verbs, 300 Common Nouns, the Intraverbal Assessment Subtest, Self-Care Checklists, compiled by Mark Sundberg and Rikki Roden, along with lists and data sheets for Motor Imitation with Objects, Gross and Fine Motor Imitation, Mand for Actions. The VB MAPP Kit Suggestions for Use now come included with every VB-MAPP Assessment Kit. This item is NOT available for purchase or download by itself. 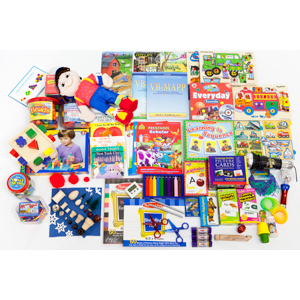 If you purchased the kit previously, please email us at abigail@difflearn.com with your order number or the name you ordered under and we will email you a copy. Written by: Different Roads to Learning on September 18, 2013.on September 17, 2013. This entry was posted in Resources and tagged Different Roads to Learning, Mark Sundberg, VB-MAPP, Verbal Behavior by Different Roads to Learning. Bookmark the permalink.